The Hubble Space Telescope M31 Panchromatic Hubble Andromeda Treasury (PHAT) mosaic image is shown in context with a ground-based image of galaxy M31. The background image, taken by Robert Gendler, was made by compositing M31 data from a 12.5-inch Ritchey-Chretien telescope with M31 data from the Digitised Sky Survey. Click the image for a high-resolution version suitable for printing. Image credit: NASA, ESA, J. Dalcanton, B.F. Williams, and L.C. Johnson (University of Washington), the PHAT team, and R. Gendler. The largest NASA Hubble Space Telescope image ever assembled, this sweeping bird’s-eye view of a portion of the Andromeda Galaxy (M31) is the sharpest large composite image ever taken of our galactic next-door neighbour. Though the galaxy is over 2 million light-years away, the Hubble telescope is powerful enough to resolve individual stars in a 61,000-light-year-long stretch of the galaxy’s pancake-shaped disc. It’s like photographing a beach and resolving individual grains of sand. And, there are lots of stars in this sweeping view — over 100 million, with some of them in thousands of star clusters seen embedded in the disc. Acknowledgment: NASA, ESA, J. Dalcanton, B.F. Williams, and L.C. Johnson (University of Washington), the PHAT team, and R. Gendler. Hubble traces densely packed stars extending from the innermost hub of the galaxy, seen at left. Moving out from this central galactic bulge, the panorama sweeps from the galaxy’s central bulge across lanes of stars and dust to the sparser outer disk. Large groups of young blue stars indicate the locations of star clusters and star-forming regions. The stars bunch up in the blue ring-like feature toward the right side of the image. The dark silhouettes trace out complex dust structures. Underlying the entire galaxy is a smooth distribution of cooler red stars that trace Andromeda’s evolution over billions of years. This cropped view shows a 48,000-light-year-long stretch of the Andromeda Galaxy in its natural visible-light colour. Click for a high-resolution version. Image credit: NASA, ESA, J. Dalcanton, B.F. Williams, and L.C. Johnson (University of Washington), the PHAT team, and R. Gendler. The panorama is the product of the Panchromatic Hubble Andromeda Treasury (PHAT) program. 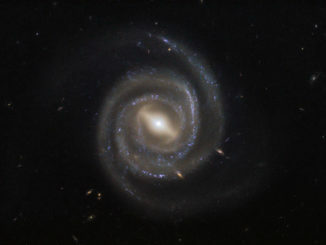 Images were obtained from viewing the galaxy in near-ultraviolet, visible, and near-infrared wavelengths, using the Advanced Camera for Surveys and the Wide Field Camera 3 aboard Hubble. This cropped view shows a 48,000-light-year-long stretch of the galaxy in its natural visible-light colour, as photographed with Hubble’s Advanced Camera for Surveys in red and blue filters July 2010 through October 2013. 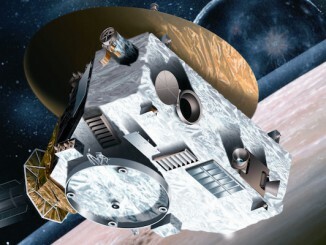 NASA’s New Horizons space probe, 10 days from a one-shot encounter with enigmatic Pluto, stopped collecting science data Saturday after a technical problem interrupted the spacecraft’s tightly-choreographed flight plan. 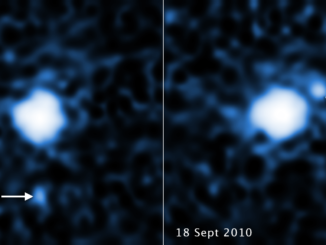 The combined power of three space observatories, including NASA’s Hubble Space Telescope, has helped astronomers uncover a moon orbiting the third largest dwarf planet, catalogued as 2007 OR10. The pair resides in the frigid outskirts of our solar system called the Kuiper Belt, a realm of icy debris left over from our solar system’s formation 4.6 billion years ago.